Social Network record: enter the username and choose the network to create a link to follow you. Available social networks: Twitter, LinkedIn, Facebook, Xing, vKontakte, Foursquare. Creates a URI or Smart Poster, depending on if you add an optional title. Business card record: select the data to include from a wealth of available fields, and create your own business card based on the universal vCard standard. Integrates with the Qt Mobility Contacts APIs. Note: usually large tag size requirements. Geo record: enter coordinates and select the Geo Tag type. 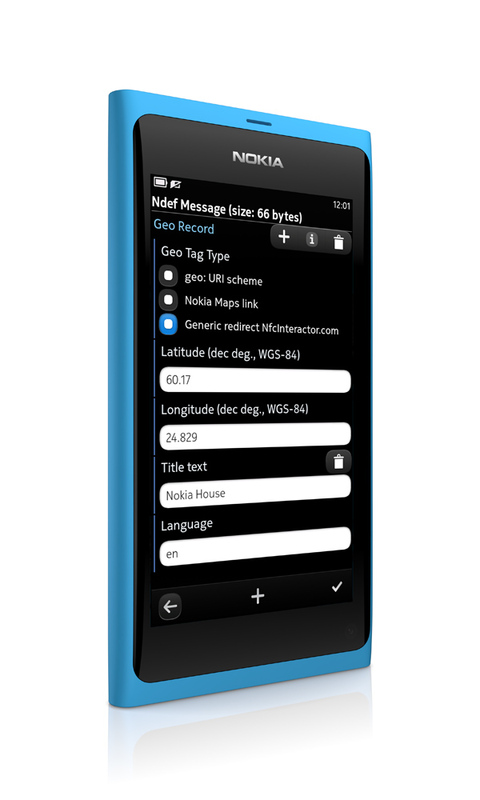 Supports Geo URI (RFC 5870), Nokia Maps links and a generic redirection script that enables Geo tags on Symbian and MeeGo, hosted at nfcinteractor.com*. Integrates with the Qt Mobility Location APIs for the coordinates. Creates a URI or Smart Poster, depending on if you add an optional title. App Store record: generate a download link to an app store. Creates a direct store link if one ID is specified, or a generic link using a platform detection script at nfcinteractor.com* if more app ids are specified. For Nokia, either specify a generic Nokia Store ID if it’s the same for all platforms, or instead specify an own ID for Symbian, MeeGo Harmattan and if needed Series 40. Creates a URI or Smart Poster, depending on if you add an optional title. SMS record: enter number and body to create a working SMS link, useful for example to request information services or for payment via SMS. Creates a URI or Smart Poster, depending on if you add an optional title. Image record: use the MIME/Image record type to store any supported image to the tag (e.g., PNG, JPG/JPEG, GIF). Images can also be included for Smart Posters and Business Cards. Smart Posters: has to contain at least a URI, optionally an unlimited amount of titles in different languages, a recommended action and information about the linked content (size and MIME type). URI records: automatically shortens URIs according to the specification to save tag space (e.g., won’t save “http://www.”, but encode that in a single byte). Text records: set text and language. Custom records: Choose the type name format and optionally add a type name and payload. Also useful for application autostart tags. NDEF record classes for: Smart Poster, Mime/vCard (Business Cards), Mime/Image, Geo coordinates, App Store links, Social Networks (Twitter, LinkedIn, Facebook, Xing, vKontakte, Foursquare), SMS, Smart URI (depending on content requirements uses Smart Poster or URI to create the smallest possible message). Tag-specifc access to read the tag size and lock status (for Tag Types 1 + 2**). Check composed record contents for errors according to specifications. * Disclaimer: The services hosted on nfcinteractor.com (e.g., the generic geo-tag redirection script) have no service or uptime guarantee. See the web services page for further details. ** MeeGo Harmattan currently does not allow tag type specific access through Qt APIs; therefore, it’s not possible to access functionality not offered by Qt classes, such as getting tag specific information or locking tags. *** Sending SNEP messages requires PR 1.2+ on the Nokia N9. **** Receiving SNEP only supported on Symbian. The public Qt/Symbian APIs only allow listening to the SNEP service name (urn:nfc:sn:snep) and not through the port (4) – so receiving messages might not work if the other phone uses the port only (e.g., Android).